I started weaving in December 2010 on a short course at West Dean College in West Sussex. I can’t say my first endeavors showed any great talent but I immediately felt very comfortable with the medium and didn’t look back. 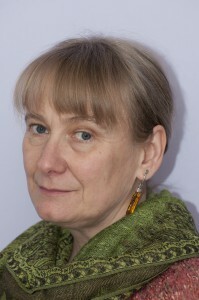 Here I am almost 3 years on, about to start a two year MFA in Tapestry Weaving and Textile Art at West Dean. I am very fortunate to live close to the college and to have found some funding to help with fees. 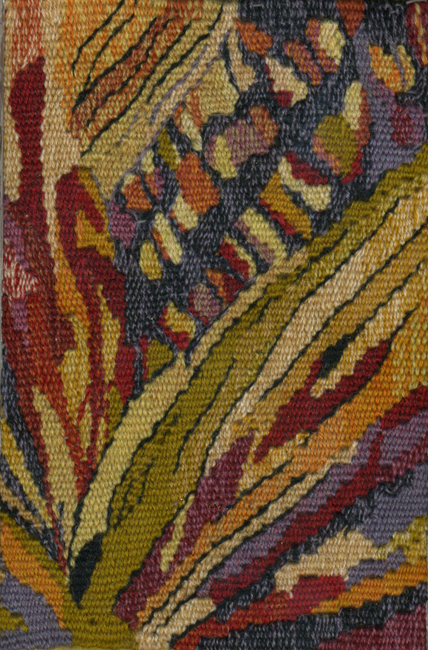 One of the problems is that tapestry is such a slow medium and therefore it is very costly to produce. But to me that is not a reason to simply abandon it. International groups like American Tapestry Alliance, British Tapestry Group and Australian Tapestry Workshop, as well as many European textiles exhibitions are going a long way to promote tapestry. West Dean’s commercial studios are in the last stages of finishing a set of unicorn tapestries for Stirling Castle. They have received a lot of coverage in the national media but unfortunately the average person in the UK street does not know what woven tapestry is. 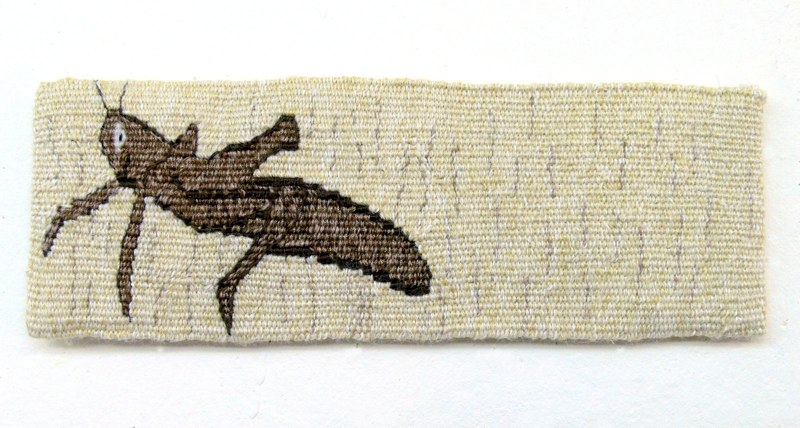 This has not been helped by several large embroidery projects in the UK recently being dubbed ‘tapestry’ – perhaps a legacy from the ‘Bayeaux tapestry.’ So it is important for weavers to promote our art. 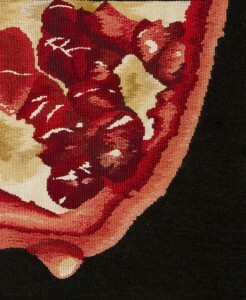 I am completely seduced by tapestry and I love the way it happens. I like the construction of it and I can see how to blend colors in a way that would simply not work with paint on canvas. I don’t like warping up much as it can be hard on the hands but I find the laying in of weft is a meditative process. I can happily weave for hours on end without having a clue what the time is. In a society which is running so fast it is impossible to stay ahead of anything I think this is a good thing. Children ought to be taught weaving in school just so they can chill out, as they say. Architects and interior designers should also be instructed on the benefits of tapestry, not just as beautiful works of art but also because of great practical benefit in modern buildings. Large areas of concrete and glass tend to be noisy disorienting places. Introducing large tapestries (or indeed any textile) can negate these effects and create a pleasant and warm atmosphere. This was, after all, one of the uses of tapestries back in the Middle Ages. I see myself as a member of a global web of weavers. It is interesting looking at weavers work from various parts of the world. There can be big cultural differences in the weaving of various communities. This is good as it enlarges the potential for our work; the more variety the more people are going to look closely at it. Whilst I am aware of the historic past of tapestry I also appreciate that looking at old tapestries is often very boring for those who are not obsessed by tapestry. These tapestries are often worn, dull and baggy; not very inspiring at all. It was noticeable in my degree show that a minimalist piece I wove received a lot of attention for this very reason. 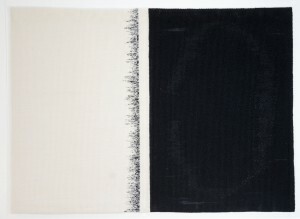 It is up to weavers to produce artwork which is contemporary with modern art. This will help the public and the art world treat our medium more seriously. My work does not engage with social and political issues. I wish in some ways it did but that is not really my thing. The tutors at college said I produced images of transient concepts in one of the most intransient of materials. My work encourages the viewer to wonder at the work, the ideas behind it and at life and the world around us. It reflects a range of interests, from microscopic images of nature to large architectural images of the industrial revolution and views of the cosmos. Nothing it seems is safe from my manipulation into tapestry weaving. When I finish college I will continue to weave and not just as a hobby. I intend to exhibit and sell work as much as I can. I do not intend to teach as teaching is not really my thing. I just hope to continue to promote tapestry as much as I can.